Arcade games used to make noise. They don’t, anymore. Not really. I’m not talking about videogames, of course, but arcade games. Being of a certain age means that I’ve actually played non-video arcade games, other than pinball, something that I suspect most people under 30 haven’t done. My favorites were the shooting gallery games. The mechanism in the era in which I was playing was light-based; the games had a small light bulb in the gun that flashed when you pulled the trigger, and light sensors on the targets. Earlier versions of these games didn’t use light, but were entirely mechanical. These games were marvelous orchestras of industrial noise. The points were tracked by clunky odometer-like wheels with numbers on them that made a satisfying ka-CHUNK ka-CHUNK noise when they spun, not a soulless LED. As targets (little metal or plastic figures of hares, or bears, or birds) moved into and out of the target area, they would click in to place, THUNK, or smoothly whiiiiiiiiirrrrrrrrrr across the field. Scores were often announced with the sound of bells. Many of these devices had electronic samples, as well, especially in later years, but the physical nature of the device was not completely abstracted. Nearly as much fun were the sports games. 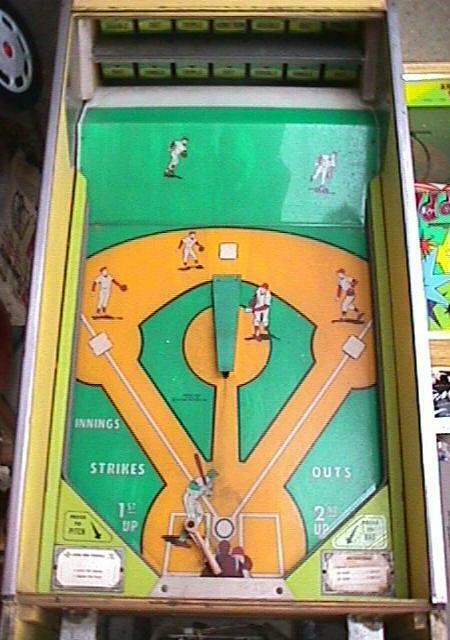 The baseball games, with their core mechanic of pitching and batting resembling pinball, were extremely well-suited to the medium. The machines encouraged abuse. The sheer physicality of slamming on the “hit” button and hearing the metallic crack of the bat on the ball was addicting. There is not, of course, a clear line dividing video games from their mechanical cousins. Early videogames used many of the same mechanical parts as the other games. I was thinking of one of these games in particular, the other day, because I couldn’t remember its name, and it was driving me insane. I described it to a friend of mine, and in doing so got specific enough to be able to research it and find the game. 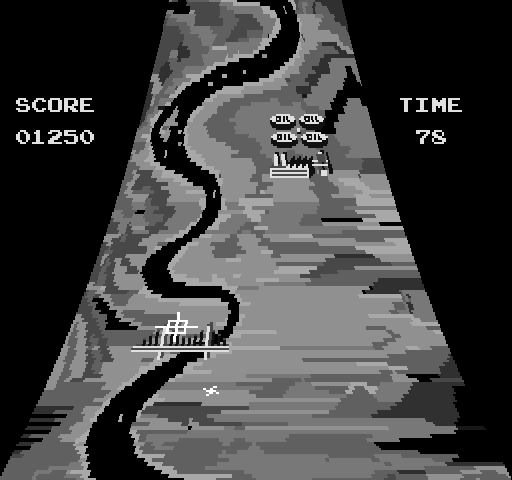 The game was a timed vertical scrolling shooter. You moved a crosshair left or right to control where your missiles landed (missiles took about a second to land, so there was some timing involved). Scrolling down the screen at you were various targets – bridges, oil depots, the occasional airplane – and your mission was to shoot as much as you could in the allotted time. Beyond that, I only remembered a few things about the game. First, it was in black and white. In at least one arcade I frequented, the game had a red filter placed on the screen so that everything was pink and black, rather than white and black. Second, the sound effects in the game were mostly modulated white noise. A little research gave me the name I was looking for: Sky Raider. It was the first continuously-scrolling video game. It was implemented on Atari’s 6502 black and white hardware. The strangest thing about this platform had to be the mirror. It wasn’t a direct-view game. The game, on the video monitor, was upside down and backwards, and in a trapezoid form. This was reflected on a mirror which was mounted at an oblique angle; the overall effect was a pretty good simulation of 3D for the time. You can play the game in the MAME emulator, but the sound doesn’t work, and you have to be willing to play it upside down and backwards. And although Sky Raiders was an electronic videogame with electronic sounds, it had a clunky control yoke that made satisfying little noises as you manuevered your crosshairs left or right. Those, of course, can’t be adequately emulated in software. Somehow without the sound it’s just not the same. Everything you could possibly want to know about mechanical arcade games can be found at Marvin’s Marvelous Mechanical Museum. I might need to make a pilgrimage to Michigan. Information on Atari’s 6502 black and white platform.